– Irish Times, Thursday, 17 August 1922. This is one of the oldest surviving photographs of Connect’s headquarters at Dunlop Oriel House in the heart of Dublin city. Located at the corner of Westland Row and Fenian Street (formerly, Hamilton Row), the distinctive red brick building is now owned by Trinity College Dublin. On Wednesday, 16 August 1922, the funeral cortège of Arthur Griffith, President of Dáil Éireann, passed by on its way to Glasnevin Cemetery. Oriel House then housed the Criminal Investigations Department of the new State. The photograph shows several people watching the procession from window ledges on the first floor. Note too the tram tracks and a member of the Dublin Metropolitan Police is identifiable (barely) at the lamp post at the street corner (An Garda Síochána had yet to be established). Historians attribute Arthur Griffith’s death at 50 years of age to overwork after several months of difficult negotiations with the British government and the Irish provisional government. After being hospitalised for tonsillitis two weeks previously, he died of a stroke on 12 August 1922. 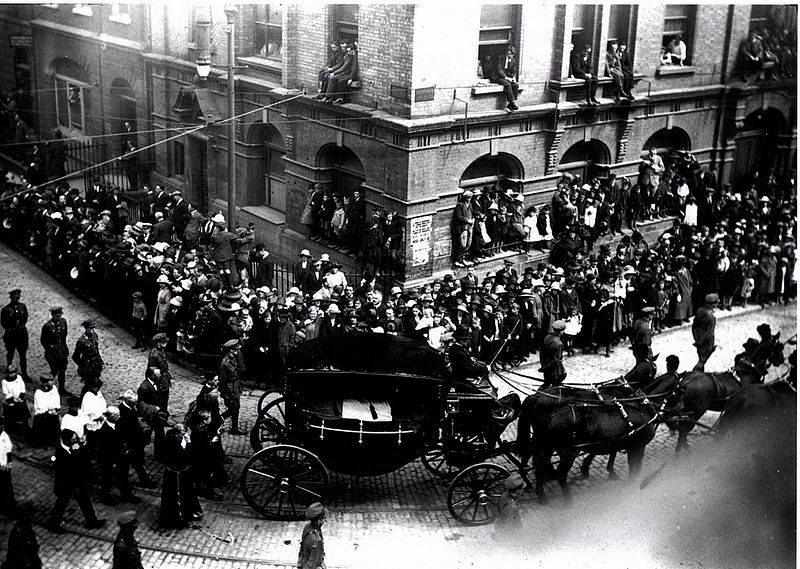 Twelve days later the funeral procession of General Michael Collins, Commander in Chief of the national army, followed the same route.